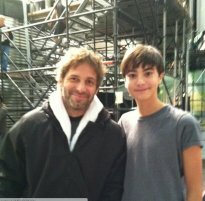 It appears that the location is not the only element of Smallville showing up in the upcoming Man of Steel Movie. An imdb Cast update has revealed that a character named Whitney Fordham will appear played by Robert Gerdisch (shown at the right in the picture). Whitney was Clark Kent’s quarterback rival in Smallville and was played by Eric Johnson in the TV series. The spelling of their last names is different (Fordham vs. Fordman) so it’s unknown just what role the character will take in the new movie.